Mosses arrived on earth before humans and even before dinosaurs. Some species of mosses quietly grew and divided during the Permian Period, around 300 million years ago, and more than 100 species were captured in fossils during the Paleogene and Neogene periods 66 to 2.6 million years ago. Isn't it time to learn some basic facts about these ancient, prehistoric plants? Mosses look like soft, low-growing ground cover, but they are different in important ways from typical flowering plants in the backyard. For starters, mosses don't flower or produce seeds. They reproduce by branching and fragmentation. They can regenerate from very small bits of their own leaves or stems, as well as by spores. Spores can germinate and grow into a branching green moss thread. Mosses don't have any of the vascular tissue other plants use to transport water and nutrients from the roots through the foliage. Given that, it makes sense that mosses don't have stems or flowers. Mosses don't have real roots either, but rhizoids instead. Both rhizoids and roots are necessary for their plant organisms to survive, but they are quite different. Rhizoids are generated from a single cell, while roots result from many cells combining together. In rhizoids, water is absorbed by capillary action, essentially between threads, while roots take in water through their own cell walls via osmosis. 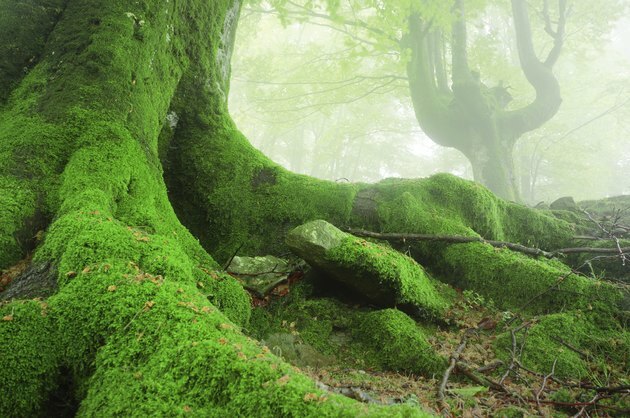 Thousands of species of moss are on the planet. Mosses are not all alike. In fact, there are around 9,000 different species of moss on the earth, and more than 1,200 of them can be found in North America. Despite the vast number of species, you can group mosses into a handful of general categories determined by where and how they grow. One huge group is sheet moss, those mosses that grow in carpets on the soil. Sheet mosses usually are a green so bright that they might have grown in Oz's Emerald City. This type of moss works well as a grass substitute when grass won't easily grow. Some sheet moss species lie flat with stubby upward shoots. However, fern moss, a type of sheet moss, has fern-like shoots that grow taller. Moss on stones is often rock cap moss. If moss isn't growing in flat mats but in rounder cushion-like clumps, you are probably looking at cushion moss. It thrives in sandy soil. 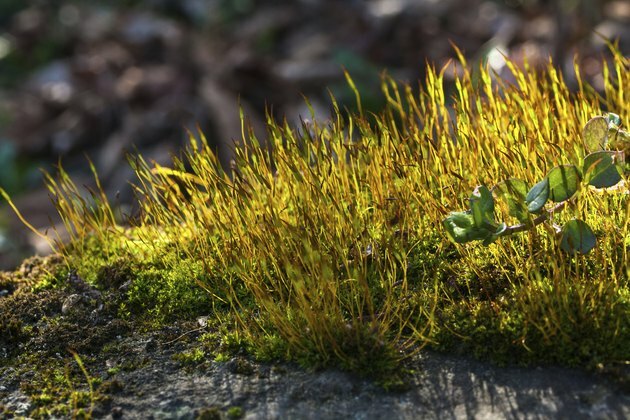 A taller species of moss is called hair cap moss. It grows in fluffy tufts and has extensive rhizoids that anchor it solidly in place. Everyone knows moss doesn't grow on a rolling stone, but if the stone stopped? It would be covered with rock cap moss, a plant that prefers heavily shaded areas. Direct sunlight can damage it. Not everything called "moss" actually is moss, however. Many soft, low-lying plants have a common name with "moss" in it, but are actually vascular plants or lichens, like Irish moss (Chondrus crispus), a red alga. Oak moss (Evernia prunastri), and reindeer moss (Cladonia species) are both lichens. Spanish moss (Tillandsia usneoides) is an air plant in the pineapple family of Bromeliaceae.